Romany’s broadcasts are introduced on the BBC Broadcasts page. Only one survives, and that has become known as the Lost Half Hour, newly available to buy on CD. This rare recording was originally transmitted in October 1943, six weeks before Romany’s death. It has remained in archives for over 60 years and is now being released to the general public for the very first time. 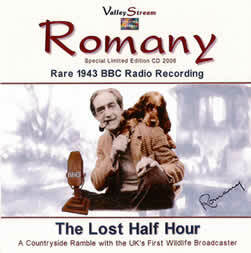 Romany of the BBC was the UK’s first wildlife presenter. Broadcasting on radio, he reached an audience of 13 million listeners. This is the last – and only remaining – recording in existence today! 2. Enchanted 21st century recording, with sound effects – how it would sound today!